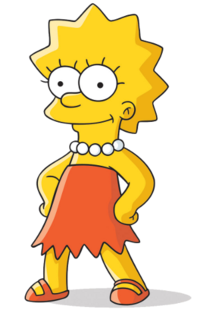 Lisa Simpson can be quite the role model for many kids, especially in comparison to her brother, Bart. When watching The Simpson’s kids can learn many good lessons from her. Tell the truth. Lisa tells the truth to keep herself out of trouble. She also finds it beneficial to be truthful because it’s the right thing to do. She will often be able to get herself out of a sticky situation because she tells the whole truth. Be kind to a fault. Lisa has a hard time making friends, so she has to try extra hard. Being kind to those that aren’t so nice is one of the ways she tries to gain more friends. It may not always work, but she sees the need to keep trying. Talk with parents about difficulties. Lisa is a pretty independent girl, but she is also not afraid to approach her parents when she is having a hard time with something. She may not always get the answer she’s looking for, especially when talking to Homer, but it seems to help to just talk it out. Reading is cool. One of Lisa’s hobbies is reading. She enjoys gaining more knowledge on her own by reading books way above her grade level. She also reads a lot to help her attain the dreams she has. Grow your vocabulary. Going along with her extensive reading, Lisa has gained a broad vocabulary. She uses many words that kids her age don’t know and that the adults also don’t know. She enjoys using it to her advantage. Respect for authority. Lisa knows who’s in charge and respects that, even if she may be a little more intelligent than all of them. She’s the kid a teacher will want in their class, because she will follow the rules to a T.
Good manners are important. Much to Homer’s chagrin, Lisa knows her etiquette. She seems to follow Marge’s example in keeping her good manners. She sits up straight and speaks politely to her elders. Use music as an outlet. Lisa is a saxophone player. Sometimes playing the saxophone can be a great way to express her feelings when she can’t come up with the words or nobody is listening. Tell an adult when someone is doing something dangerous. Lisa is not afraid to go to an adult to tell them when another child is doing something dangerous. It may be to make herself look good, but other times she does it for the safety of others. You can be smarter than those older than you. Lisa is a very bright girl. She’s definitely smarter than her older brother, Bart, and I would venture to say she is more intelligent than most adults featured on the show. She uses her brilliance to achieve the goals she has set for herself. Lisa has higher standards than most kids in her class and even many adults. Kids can learn many good lessons from following her example on the show.